With Dubai firmly focused on becoming a tourism powerhouse, events like Expo 2020 are creating a momentum in the construction sector, which has recovered since the 2008 real estate bubble burst, writes MRIDULA BHATTACHARYA. As the five-year countdown to Expo 2020 begins, Dubai’s construction sector is flourishing once again, driven by numerous projects linked to the prestigious event. This year is expected to be a period of growth for the sector with more projects related to Expo 2020 likely to be unveiled, while the momentum generated last year with the launch of mega projects like the Dubai Park and Resorts and Mall of the World, is expected to grow year on year. The primary goal is to boost the tourism sector, which is having a ripple effect on the real estate market and infrastructure development. 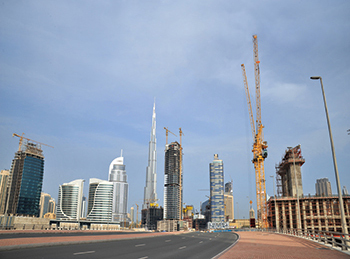 According to a report from the Dubai Statistics Centre, the construction sector contributed 7.89 per cent or Dh13.4 billion ($3.64 billion) to Dubai’s GDP (gross domestic product) of Dh170.7 billion ($46.4 billion) in the first half of 2014 – a figure that is set to grow significantly by 2020. A recent report by the Oxford Business Group noted that the construction sector’s growth has been driven by projects linked to higher tourism numbers and upcoming international events, and Dubai Expo 2020 in particular. Expo 2020 preparations are expected to generate $23 billion, or 24.4 per cent of current GDP, between 2015 and 2021. Market conditions have improved significantly since the 2009 real estate meltdown. Tighter regulations, coupled with strong fundamental demand, have ensured that the future of the emirate’s real estate market is a bright one, according to OBG. This would result in increased demand for residential and commercial units as well as infrastructure. “Expo 2020 infrastructure alone is expected to cost more than $9 billion. The Expo site in Jebel Ali, covering 438 hectares and designed to host up to 300,000 visitors at peak times, will cost between $2 billion and $4 billion. Infrastructure development, including the $1.36-billion expansion of the metro’s Red line to the exhibition site, has been allocated a further $2 billion to $4 billion. These projects alone will offer an enormous stimulus to the construction industry,” according to the OBG report. The tourism sector is slated to be among the biggest beneficiaries as a substantial number of projects are in the pipeline to meet the demand. The sector is expected to grow between seven to nine per cent over the next few years and the number of hotel rooms is expected to double 2020. Dubai needs to deliver 283 new hotels until 2020 to accommodate its target of 20 million visitors by the end of the decade, according to Deloitte. Taking into account 56 hotels currently under construction or in the final stages of planning, as per the data provided by STR Global, a leading source of global hotel information, this means that approximately 227 additional hotels are required to meet the projected supply by 2020. Factoring in the typical hotel development cycle of between 36 and 48 months, the majority of the planning for the remaining 227 hotels would need to be completed prior to 2017 for delivery by 2020, the report said. JLL, a leading real estate investment and advisory firm, also noted that the momentum will continue with activity bolstered by major project spending relating to the Expo. However, a major dampening factor over recent months has been concerns about the negative impact of lower oil prices on the UAE’s economy and the market. Nevertheless, JLL points out that Dubai’s success at diversifying its economy and the continued growth of non-oil sectors makes it less vulnerable to lower oil revenues than other GCC oil exporters. Dubai World Trade Centre (DWTC) has recently appointed a consortium of US-based CH2M Hill and UK-headquartered Mace to undertake all real estate and construction delivery related programme management services for its Dubai Trade Centre Jebel Ali development. The proposed development, which includes a dedicated gated 150-hectare expo area, and a surrounding residential, hospitality and logistics zone, will host close to 250 participants. 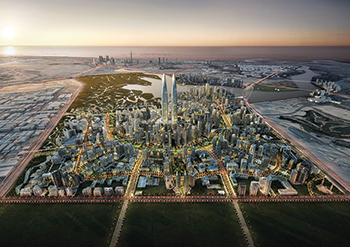 CH2M Hill-Mace is providing full-service consultancy, real estate programme management, design, construction and operations management for the end-to-end development and delivery of Dubai Trade Centre Jebel Ali and the Expo 2020 Dubai site. The venue will play host to the anticipated 25 million visitors during the Dubai Expo 2020 to be held from October 20, 2020 to April 10, 2021. Dubai Creek Harbour ... to accommodate 39,000 homes and 22 hotels. The last few months have witnessed the launch of some multi-billion-dirham master developments that will change the landscape of the emirate in the coming few years. These include the Dh25-billion ($6.8 billion) Mall of the World, which is set to break ground shortly. The 48-million-sq-ft project, to be developed by Dubai Holding along Sheikh Zayed Road over a 10-year period, will feature the world’s largest mall occupying 8 million sq ft and will be connected to 100 hotels and serviced apartments buildings with 20,000 hotel rooms. The development will include a temperature-controlled covered retail street network, the world’s largest indoor family theme park, a wellness district, and a cultural district. Another mega project unveiled late last year is the Dubai Creek Harbour, hosting the world’s tallest twin towers as its centrepiece. The project, which will be developed by Emaar Properties in partnership with Dubai Holding, has been designed to accommodate 39,000 homes and 22 hotels. In the last quarter of 2014, Dubai Parks and Resorts (DPR) launched work on a Dh10.5-billion ($2.86 billion) entertainment hub featuring diverse theme parks that will spread across 25 million sq ft of land located on Sheikh Zayed Road close to the Palm Jebel Ali. The first phase of the project is scheduled to open in October 2016. The development comprises three separate theme parks: motiongate Dubai, a Hollywood movie-inspired theme park concept; Legoland Dubai, the first Legoland theme park in the Middle East; and Bollywood Parks Dubai, a first-of-its-kind entertainment destination that will showcase the authentic Bollywood movie experience. It will also host Hotel Lapita, a four-star themed hotel, and Riverland, a 220,000-sq-ft centrally located retail, dining and entertainment district. DPR is expected to sign off contracts totalling Dh2.5 billion ($680.6 million) on the project this year to add to the around Dh5 billion ($1.36 billion) awarded in 2014. Another ambitious development launched last month by Dubai-based developer Nshama is the Town Square development, which will house over 3,000 townhouses, 18,000 apartments, 350 shops, one Vida hotel, parks, healthcare facilities, schools and cycling trails. Nshama will soon be issuing the tender for construction of 1,700 apartments (see Real Estate feature). Among other landmark developments is the Jewel in the Crown luxury villas and mansions at Akoya by Damac master development (see Real Estate feature). Akoya by Damac is a 42-million-sq-ft luxury lifestyle community in Dubailand, set around the first Trump-managed golf course in Asia – The Trump International Golf club, Dubai. The first residents are expected to move into the Damac property early next year, with the full project set for completion by 2018. Damac is also spearheading the development of the 1,250-key Paramount Hotel Dubai, Downtown in Business Bay, in collaboration with Paramount Hotels & Resorts (see Page 52). Other developers including Dubai Holding, Nakheel, Meraas, Sobha Group (see separate report), Meydan Group, Omniyat, and Al Wasl have all announced new projects, expansion of existing ones or are reviving projects that were stalled during the financial crisis. At last year’s Cityscape Global, for instance, Meydan Group announced two new projects, Mohamed Bin Rashid Al Maktoum (MBR) City – District Eleven and Meydan Avenue. MBR City – District Eleven is a suburban mixed-use community development featuring parks, private schools and retail businesses, while Meydan Avenue – previously known as Diamond Business Park – will offer a blend of residential, commercial, retail and recreational facilities. The Wasl Group is spearheading a number striking landmarks including the Zabeel Park One, taking shape in Zabeel Park, which comprises a tower in the shape of Number One, signifying Dubai’s ambitions on the global arena. It will also develop the Al Wasl Tower on Shaikh Zayed Road, which will feature the world’s tallest ceramic façade, in addition to vertical gardens and a light museum — the first of its kind in the region. The developer also has plans for the Dar Wasl project, an 80,000-sq-m residential development on Al Wasl Road, Jumeirah. The public sector too has initiated a fair share of striking projects. Among them are the Aladdin City by Dubai Municipality, which has just been given the go-ahead. The complex of towers, inspired by characters from Arabian Nights, including Aladdin and Sinbad the Sailor, is expected to take shape at a prime location of Dubai Creek. It will comprise three towers with commercial and hotel space spread over a distance of 450 m on the creek. Among other developments, Dubai Multi Commodities Centre (DMCC) has appointed US firm Turner to project manage its upcoming Burj 2020 District, which will also be home to the world’s tallest commercial tower named Burj 2020 in honour of Dubai’s Expo 2020 win. Other key developments include the Dubai Design District (d3), the newest of Tecom Investments’ freezone business parks, where 11 buildings are currently under construction. Once complete, d3 will be a purpose-built environment catering to the full value chain of the design, fashion and luxury industry. Dubai is also boosting the capacity of its airports as well as putting in place a road, metro and tram network to cope with the growing demands of the emirate. Dubai World Central (DWC), the world’s first purpose-built aerotropolis, is pressing ahead with its $32-billion expansion plan that will be carried out over the next six to eight years (see separate report). In the roads sector, one of the major infrastructure projects under way is the Dubai Water Canal project, work on the first phase of which is 40 per cent complete (see UAE Focus). Among the key road projects are the Parallel Roads Improvement Project, and 2,700-m Al Ittihad bridge project, which will span across the Dubai Creek. RTA is also reviewing plans to extend the Dubai Metro to the Expo 2020 site. Both the Red and Green lines will be extended by around 40 km – 20.6 km on the Green Line and 18.5 km on the Red Line to the Expo site. Dubai also flagged off its own tram network last November. The first phase of the project consists of a 10.6-km-long track and a fleet of 11 trams. Fourteen trams will be added in Phase Two to make a total of 25 operating trams. The tram is expected to transport about 66,000 passengers per day by 2020.